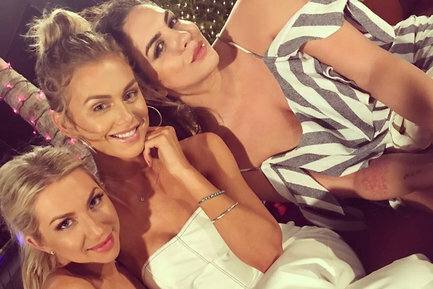 iRealHousewives | The 411 On American + International Real Housewives: PHOTOS: Lala Kent Spotted Hanging Out With Katie Maloney-Schwartz And Stassi Schroeder! PHOTOS: Lala Kent Spotted Hanging Out With Katie Maloney-Schwartz And Stassi Schroeder! Earlier this summer it was reported that Jax Taylor and James Kennedy ended their longtime feud and started building a friendship. Now it looks like another Vanderpump Rules feud has ended. Recently, Lala Kent was spotted out and about with longtime foes, Katie Maloney-Schwartz and Stassi Schroeder. "This is a first... but hey, chemistry is chemistry. Also sprang tans are chemistry. Also, hello. Edit: 'sprang tans' are a real," Katie shared about the hangout sesh, with Lala simply adding: "Tekilla bubba." As for Stassi's take on the whole thing? Well, she had this to say: "Tequila is an upper. Just FYI." Tequila is an upper. Just FYI.